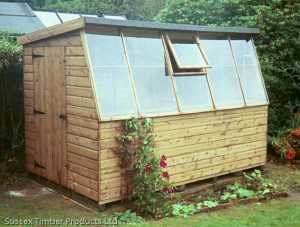 Solar Sheds » Sussex Timber Products Ltd. The Solar is available in pent roof type, with two types of cladding - T&G Shiplap and T&G Loglap. 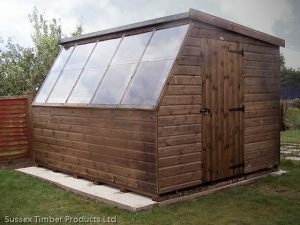 All fixtures and fittings, fixings, roofing felt and glass are included for D.I.Y installation. Prices are listed below, if you would like us to install your shed for you. Extra heavy duty bearers are also available if required. 2"x1½"(50mm x 38mm) framing used throughout. 19mm or 22mm thick cladding. Door hung on 3 't' hinges and secured with pad-bolt & turnbuckles. Factory treated with spirit based treatment. Additional heavy duty floor bearers. Framing: 2"x1½"(50mm x 38mm) softwood. Shiplap cladding: ex.19mm softwood T&G Shiplap (finished at 16mm). Loglap cladding: ex.22mm softwood T&G Loglap (finished at 19mm). Door: 2'6"(760mm) x 5'9"(1800mm) Ledge & braced door. Floor & roof: ex.16mm softwood T.G.V. on 50mm x 38mm joists. All buildings are made to order. All quoted 'standard' sizes and prices are for general guidance only, and do not refer to any specific building. The information provided does not constitute, nor constitute any part of, an offer or contract. Building sizes quoted are solely for convenience and should not be considered accurate. Please contact us for exact sizes before carrying out any base work. Unless stated as 'finished', as is the industry 'norm', timber sizes are nominal, i.e. before machining.